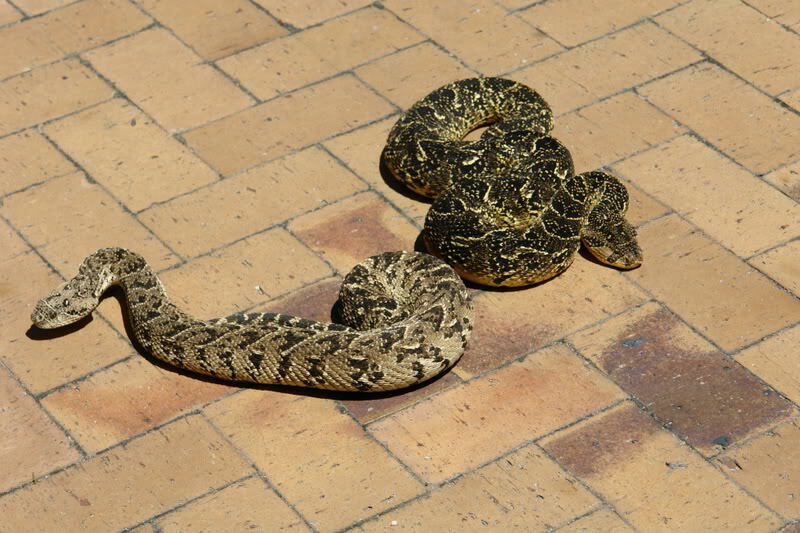 Puff Adder Bites - check out these! 24 hours after a puff adder bite on the calf. 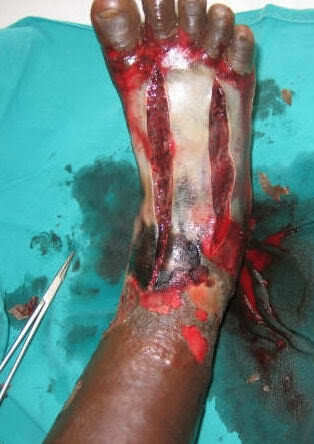 The patient had restricted blood supply to the foot and the leg has been cut to relieve the severe swelling pressure. 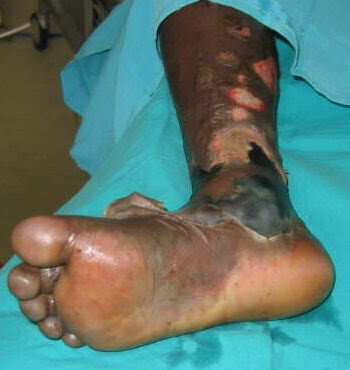 Note extensive blistering and swelling. Photo Dr. M. B. Penderton. Gosh!!! 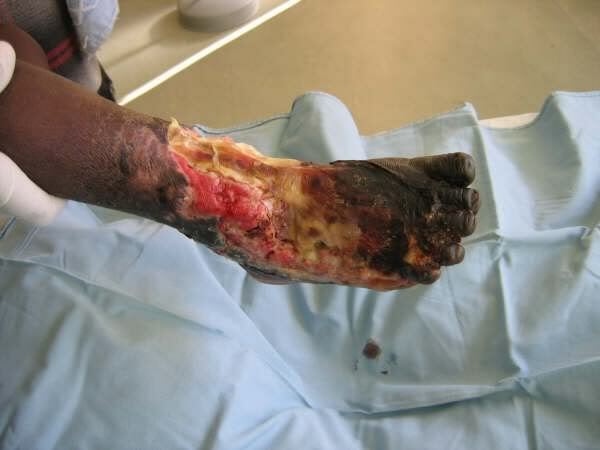 thats Cytotoxic venom for you! An interseting observation would be to have a sort of statistic on where and when most bites occur, cos I often walk about, and they are not really found on the beaten track that often, and when you do approach them its not that difficult to hear their warning. Some guys watch too much tv, and try to get real close to the snake, when they dont need to. From what feedback Ive got from people who come across these animals in their homes, I can see how they can get bitten, like a chap that told me last week how he removed an adult puffy from his home, with a broomstick while holding the tail!! Whereas the best if you dont have equipment is a spade, just scoop it on a spade, and safely move it. In my opinion around towns etc, most bites are to people who try and move, kill or play around with the animals. They are good and valid comments there Bogga, man should learn to respect and leave well alone. A 12 year old girls leg was amputated bellow the knee last week due to a puff bite. I keep these guys and yes I still crap myself when moving or handling them. The speed of a bit is a foot in a tenth of second. 100% strike rate. And people say I'm crazy? Sometimes to be a little physiologically touched helps. I do admit I even scare myself but fear is good or it’s that dang jacket with the long sleeves again. OMG they are the worse wounds than i've ever seen and that was only in bed sores, I couldn't imagine what the sight, smell and the pain of those would be!!!! Sadly this is the one who lost her leg below her knee the other day. Ja, that girl was fortunate they amputated when they did, it could have cost her life! 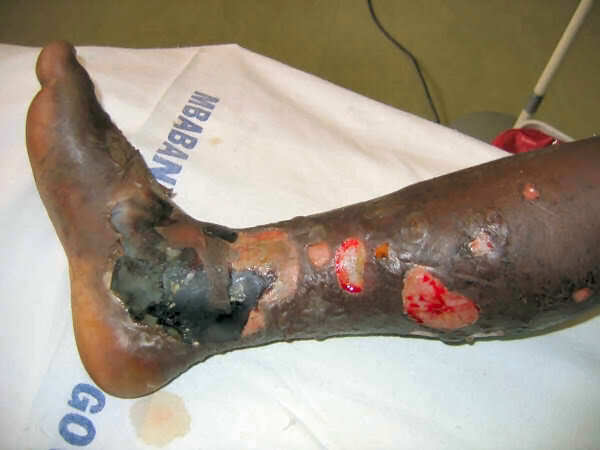 her losing her leg was the result of incompetent and substandard medical practice, they did not administer anti venom when they should have, and even though they never had anti venom, she was only half an hours flight from the bigger state hospitals where they could have helped her properly. I love handling the puffies, and they are awsome, but that is one animal I dont want biting me! My Rinkhals venom has a cytotoxic factor, but fortunately not as toxic as that of the Puffie! and he prefers to spit the crap out of anything that moves. im getting in 2 Copperheads, now that will be interesting! just shouldnt get bitten then. Nice puffies SNakes Inc! the bright one your female? will she be a mommy this year? will she be a mommy this year? Naa I had problems with finding homes for her last batch. Maybe next season. Ja, I wouldnt breed puffies either, unless the parents were wild caught, then I would release them into the wild, close to where the adults were found. Just the thought of having up to 30 baby puffs around gives me the shivers!! each one capable of changing your life! Yeah a puff can strike very quickly and in that short space of time changes things forever on the receiving end. 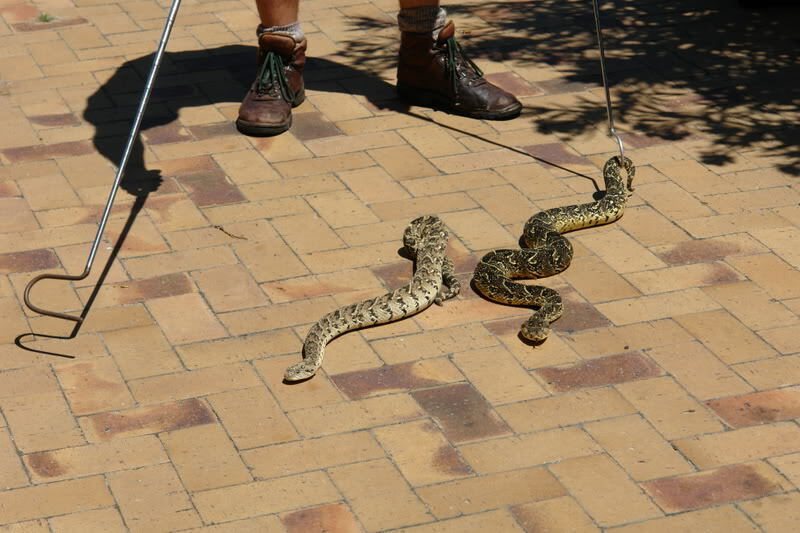 Subject: Re: Puff Adder Bites - check out these!